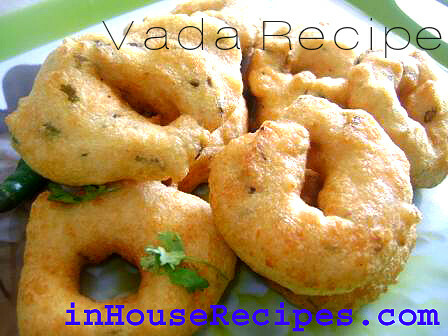 The Vada with a hole is a famous snack and breakfast of South India. Although it is best enjoyed when it is submerged in Sambar and eaten with Coconut chutney, I simply love it and can even enjoy it without the coconut chutney and Sambhar. Soak urad dal overnight in water. Start with grinding the dal to a fine paste in grinder. If the dal paste is thick, you can add 3-4 tsp of water to lighten it a bit and grind again. Finely chop the Green Chili so that they do not hurt while eating! Take a bowl, add Ural dal paste. Add 1 Tbsp of water and mix well. Add Salt, Soda, Green Chili and chopped Coriander leaves. Mix well. Beat the mixture for atleast 4-5 min.. This will help make the Vada soft and fluffy. After beating the mixture for 4-5 min., you will feel that the paste has expanded in size and has become light. Take a frying pan and add enough Oil and heat it on high flame. 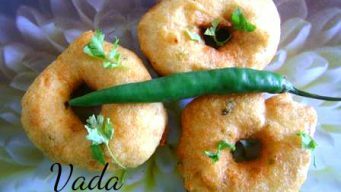 For making vada, apply water on your left hand palm. Pick a small portion from vada paste and keep on left palm. Now dip right hand’s index finger in water and make a hole in vada. Now carefully place this vada in frying pan. Fry until it turns golden brown fro both the sides on medium flame. Take out once it is golden brown. Vada with a hole is ready to serve. Enjoy it with Sambhar or Cononut Chutney. 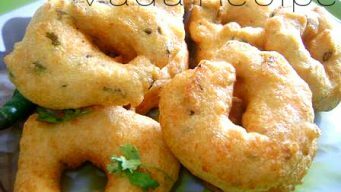 Vada is normally served with Sambar. You sub-merge it completely and then use a use to cut pieces and eat. 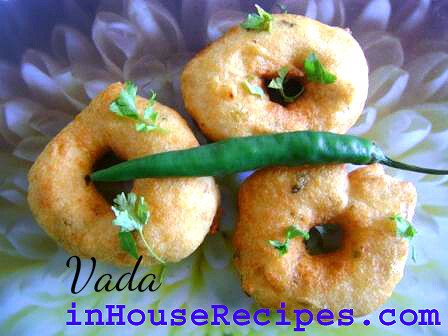 You can refrigerate vada's and re-heat in Microwave before serving.